I’ve been watching Henry Jenkins video on Edutopia. 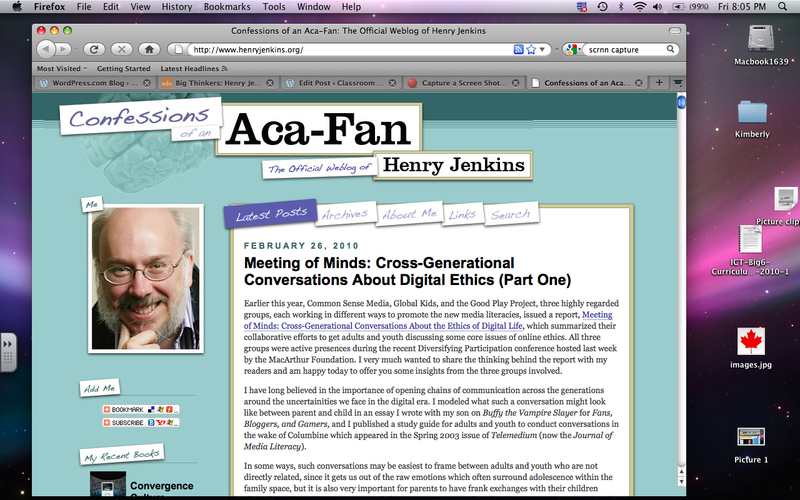 Big Thinkers: Henry Jenkins on New Media and Implications for Learning and Teaching | Edutopia. He believes that students and teachers are being hampered by schools due to filtering and sites being blocked. The access to technology is being restricted by school IT departments who are not the people actually using the technology. I’m starting to see this trend in my own school division. I know that the internet has more filters and restrictions in the high schools in my school division and right now there are very few sites filtered in the elementary schools. This means that my students and I can access information, videos and web tools whenever we want to. Yes, occasionally a student goes on a site I don’t want them to go on but that becomes a teaching opportunity when I talk about digital responsibility. Jenkins also states that teachers and districts need to recognize that there is a lot of learning going outside of schools. He believes that educators need to value this learning and incorporate it into our teaching. If we give students to discuss and share what they are learning beyond our four walls we open up our classrooms to rich sharing and discussion opportunities. Jenkins states that it is time to get rid of the roles of digital natives and digital immigrant. I’ve often thought that those terms were over used and not always correct. There needs to be a shift that we work and learn together particularly in a culture of connectiveness and sharing. Jenkins also believes that we need to move away from the autonomous model of learning and move to a collaborative culture of students and teachers being partners in education. To accomplish this teachers need to be connected and build a supportive and social network to support the work they want to do in their classrooms. 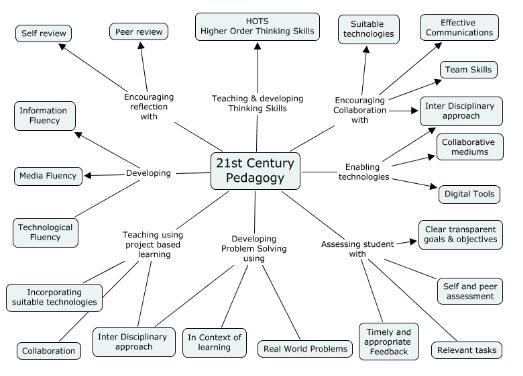 I believe that if teachers are connected we are more apt to connect our students to enrich their learning. Jenkins suggests we need to make a paradigm shift in our teaching to give students the skills they need to work in the new media landscape: play, performance, judgement, networking, negotiation, collective intelligence and appropriation. These are collaborative skills that translate into all subject areas and into students lives beyond school. The bottom line is that students won’t remember a lot of the subject content that we teach them but they will carry they skills we teach them far beyond us. Jenkins poses some interesting discussion questions which makes me consider the roles of teachers, technology and schools in teaching students for the future. 1. How are schools limiting kids’ access to digital tools? Do you agree with these policies? 2. Do you see the participation gap in your school and community? 3. How do we create shared learning opportunities across generations? 4. Are schools ready to give up control to kids, families, and communities of learning? What are the opportunities and challenges? 5. What does authorship mean in the digital age? How do we teach it to kids? 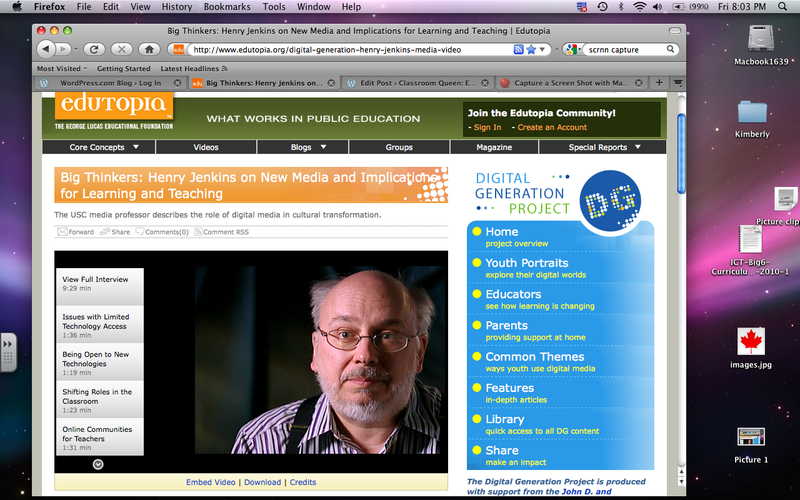 Big Thinkers: Henry Jenkins on New Media and Implications for Learning and Teaching | Edutopia. I finished reading Will Richardson’s article “Footprints in the Digital Age” this morning and I thought about my footprint then about my students. So in the spirit of Block 5 I thought about I could use digital tools to represent my learning. I decided to create an Animoto movie with the ideas from Will’s article. I love using Animoto for my own projects and it’s a great alternative to iMovie for my students to use. 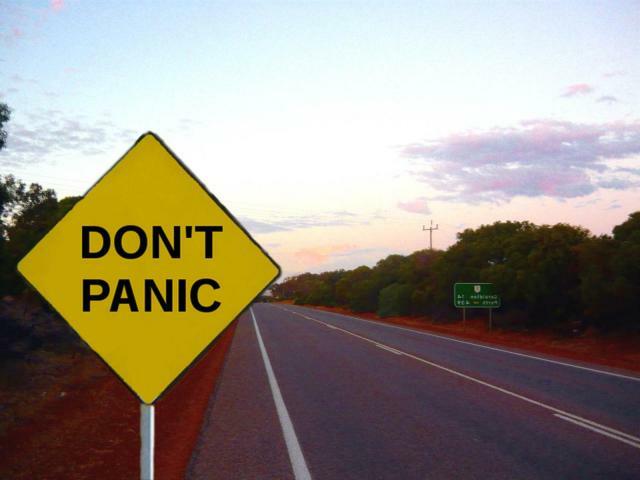 The tricky part is that I’m having a tough time embedding it on this wordpress blog. I’ve tried exporting it directly but wordpress is not recognizing my password when I export from Animoto. I downloaded the movie to my desktop but because I don’t have Quicktime Pro I couldn’t export or upload it to my blog post. So I’m on attempt number three. I’m uploading the Animoto movie to YouTube then I will get the html link from Youtube to insert in this post. You’ll know if you see the movie that it worked. This exercise reinforces the concept to me that we don’t have to be technology experts but we must be willing to learn with our students, experiment, experience technological defeat and be ready to try again. I’ve been busy wrapping up the end of another school year and leaving for summer vacation. I returned home this past Saturday and again got busy finishing up a presentation for provincial science teachers. Interested science teachers in the province were attending a four day conference at The University of Regina. 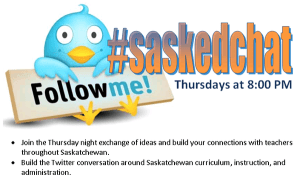 The province of Saskatchewan is in the process of piloting new middle years science units. I’ve been involved in the piloting for the past school year by attending meetings, discussing the curriculum with other science teachers and piloting new units. I’ve enjoyed the process and the opportunity to provide feedback from myself and my students as we work our way through the new curriculum. This past Wednesday I presented technology links, activities, simulations, lesson and unit plans for two of the grade six units: Flight and Space. I had organized my information on wikis using the draft curriculum and organizing the links based on the expected outcomes and their learning indicators. My first question from my audience was “What’s a wiki?” At that point I had to do some back tracking and explain the Web 2.0 tools I was using. Throughout the presentation I was asked questions about how I had used technology and Web 2.0 tools to prepare my presentation. By the end of the session I had explained wikis, classblogmeister, delicious, diigo and twitter. I also discussed the power of networks particularly for the teachers who work in rural communities within the province. At one point one of the attendees asked the organizer if I could come back next year and present specifically on Web 2.0 tools and their application for science teachers. My biggest worry when the questions starting coming was not to overwhelm anyone with the variety of networking tools I was using. I know that it can be a bit intimidating when you’re new to technology and someone is spouting off names and links when you’re just starting out. I wanted to assure everyone that a year and a half ago I had started with a class blog, six months later added wikis and continued from there as I had time. My advice was that the teachers choose one tool to begin with and slowly add to their repetoire. Many of the teachers were interested in using wikis to organize their unit plans so I left my email address and invited questions as they began their technology journey. I hope I inspired some teachers to use Web 2.0 tools in their teaching even though that wasn’t my intent when I planned my presentation. I’ll post links to the new units with the technology resources as soon as the Ministry of Education approves the new curriculum.